This article is about places of human settlement. For the process of settlement, see Human migration. For other uses, see Settlement. "Populated place" redirects here. For USGS definition of a populated place, see Unincorporated area. 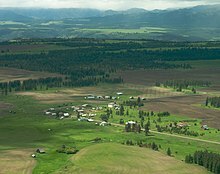 The small town of Flora, Oregon in the United States is unincorporated, but is considered a populated place. 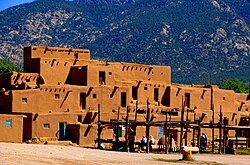 Taos Pueblo, an ancient pueblo belonging to a Taos-speaking Native American tribe of Pueblo people. It is approximately 1000 years old and lies about 1 mile (1.6 km) north of the modern city of Taos, New Mexico. In geography, statistics and archaeology, a settlement, locality or populated place is a community in which people live. The complexity of a settlement can range from a small number of dwellings grouped together to the largest of cities with surrounding urbanized areas. Settlements may include hamlets, villages, towns and cities. A settlement may have known historical properties such as the date or era in which it was first settled, or first settled by particular people. In the field of geospatial predictive modeling, settlements are "a city, town, village or other agglomeration of buildings where people live and work". A settlement conventionally includes its constructed facilities such as roads, enclosures, field systems, boundary banks and ditches, ponds, parks and woods, wind and water mills, manor houses, moats and churches. The oldest remains that have been found of constructed dwellings are remains of huts that were made of mud and branches around 17,000 BC at the Ohalo site (now underwater) near the edge of the Sea of Galilee. The Natufians built houses, also in the Levant, around 10,000 BC. Remains of settlements such as villages become much more common after the invention of agriculture. Some settlement sites may go out of use. This location in Estonia was used for human settlement in 2nd half of first millennium and it is considered an archaeological record, that may provide information on how people lived back then. Landscape history studies the form (morphology) of settlements – for example whether they are dispersed or nucleated. Urban morphology can thus be considered a special type of cultural-historical landscape studies. Settlements can be ordered by size, centrality or other factors to define a settlement hierarchy. A settlement hierarchy can be used for classifying settlement all over the world, although a settlement called a 'town' in one country might be a 'village' in other countries; or a 'large town' in some countries might be a 'city' in others. Geoscience Australia defines a populated place as "a named settlement with a population of 200 or more persons". The Committee for Geographical Names in Australasia used the term localities for rural areas, while the Australian Bureau of Statistics uses the term "urban centres/localities" for urban areas. The Agency for Statistics in Bosnia and Herzegovina uses the term "populated place" for rural, and "municipality" and "town" for urban areas. The Bulgarian Government publishes a National Register of Populated places (NRPP). The Canadian government uses the term "populated place" in the Atlas of Canada, but does not define it. Statistics Canada uses the term localities for historical named locations. The Croatian Bureau of Statistics records population in units called settlements (naselja). The Census Commission of India has a special definition of census towns. The Central Statistics Office of the Republic of Ireland has a special definition of census towns. There are various types of inhabited localities in Russia. Statistics Sweden uses the term localities (tätort) for various densely populated places. The common English-language translation is urban areas. The UK Department for Communities and Local Government uses the term "urban settlement" to denote an urban area when analysing census information. The Registrar General for Scotland defines settlements as groups of one or more contiguous localities, which are determined according to population density and postcode areas. The Scottish settlements are used as one of several factors defining urban areas. Populated place − place or area with clustered or scattered buildings and a permanent human population (city, settlement, town, village). A populated place is usually not incorporated and by definition has no legal boundaries. However, a populated place may have a corresponding "civil" record, the legal boundaries of which may or may not coincide with the perceived populated place. Census − a statistical area delineated locally specifically for the tabulation of Census Bureau data (census designated place, census county division, unorganized territory, various types of American Indian/Alaska Native statistical areas). Civil − a political division formed for administrative purposes (borough, county, incorporated place, municipio, parish, town, township)." Populated places may be specifically defined in the context of censuses and be different from general-purpose administrative entities, such as "place" as defined by the U.S. Census Bureau or census-designated places. In the field of geospatial predictive modeling, settlements are "a city, town, village, or other agglomeration of buildings where people live and work". The Global Human Settlement Layer (GHSL) framework produces global spatial information about the human presence on the planet over time. This in the form of built up maps, population density maps and settlement maps. This information is generated with evidence-based analytics and knowledge using new spatial data mining technologies. The framework uses heterogeneous data including global archives of fine-scale satellite imagery, census data, and volunteered geographic information. The data is processed fully automatically and generates analytics and knowledge reporting objectively and systematically about the presence of population and built-up infrastructures. The GHSL operates in an open and free data and methods access policy (open input, open method, open output). The term "Abandoned populated places" is a Feature Designation Name in databases sourced by the National Geospatial-Intelligence Agency and GeoNames. Populated places can be abandoned. Sometimes the structures are still easily accessible, such as in a ghost town, and these may become tourist attractions. Some places that have the appearance of a ghost town, however, may still be defined as populated places by government entities. A town may become a ghost town because the economic activity that supported it has failed, because of a government action, such as the building of a dam that floods the town, or because of natural or human-caused disasters such as floods, uncontrolled lawlessness, or war. The term is sometimes used to refer to cities, towns, and neighborhoods that are still populated, but significantly less so than in years past. Wikimedia Commons has media related to Populated places and Settlements. ^ a b Dutta, Biswanath; Fausto Giunchiglia; Vincenzo Maltese (2010). "A Facet-Based Methodology for Geo-Spatial Modeling". GeoSpatial Semantics: 4th International Conference, GeoS 2011, Brest, France (PDF). p. 143. ^ "NTMS Specifications (250K & 100K): Populated place". Australian Government. Archived from the original on June 3, 2011. Retrieved July 26, 2011. ^ "Glossary Search Results". Atlas of Canada. Natural Resources Canada. Archived from the original on October 6, 2012. Retrieved July 26, 2011. ^ a b c "Feature Class Definitions". United States Geological Survey. Retrieved July 26, 2011. ^ "Maps of Kolmanskop – Namibia 2012". Map Atlas – Google Maps based atlas of the world. MapAtlas.org. 2012. Archived from the original on April 15, 2013. Retrieved February 11, 2012. ^ "Feature Designation Code Lookup". NGA: Geonames Search – OGC Viewer. Springfield, VA, USA: National Geospatial-Intelligence Agency. Archived from the original on January 2, 2012. Retrieved February 11, 2012. ^ "GeoNames Feature Codes". GeoNames. GeoNames. February 10, 2012. Retrieved February 11, 2012.